The greatest portion of the Himalayas is in India. There are vast areas of wilderness which have a great diversity of wildlife. These rugged mountains are also the home of some very unique people groups. Treks in Ladakh and Zanskar can take you away from civilization for days through remote wilderness, or take you to meet wonderful people who live in villages that seem to still be in a previous century. Ladakh is a high altitude desert. Most of Ladakh is over 10,000 feet in elevation and the average height of the peaks is over 19,000 feet (6,000m). Trekking can be entirely wilderness or include passing through small remote villages. The area is vast so the options are too. The views are absolutely amazing! The scenery is stunning! The wilderness is inspirational! 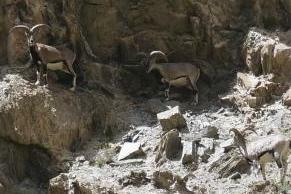 The mountains are home to a wide variety of wildlife; Blue Sheep, Ibex, Wild Horses, Marmots, Snow Leopards, and many others. (It is easier to find the Snow Leopard tracks than to actually spot them – but the tracks definitely reveal their presence.) There are eagles, hawks, and many other species of birds. There is a beautiful variety of high altitude wildflowers and they are abundant throughout the trekking season. There are also tribes of nomads who graze their flocks of sheep, yak, and goats in the mountains during the summer months. TREK ACROSS KARNAK One of our recommended treks is Across Karnak which is a 12 day trek that goes though some absolutely stunning gorges, over some marvelous passes and is not one of the main tourist routes. The trek goes from Pang to Hemis. This area of wilderness is a great place to see a wide variety of wildlife. Trek Tsomoriri to Kibber - from Ladakh to Spiti Trekking from the Tsomoriri Lake in Ladakh to Kibber in Spiti takes you through remote wilderness. This is one of our favorite treks because of the beauty and the high chances of seeing wildlife. This 8 day trek takes you one whole day along the Tsomoriri Lake, crosses a glacier and the Parang La pass. The glacier is not technical but it is always a special experience to cross a glacier in the middle of summer. 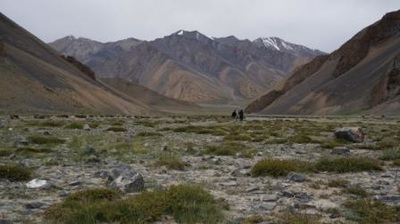 Leh Highlights Tour A great way to acclimatize for your trek is to take the opportunity to explore and experience some very unique places in and around Leh, the capital of Ladakh. Pangong is a salt water lake at almost 14,000 feet above sea level. The ancient Buddhist Monastery of Diskit is in the Nubra Valley which is a desert complete with sand dunes and Bactrain camels that is 10,000 feet above sea level. Ladakh was an independent kingdom for nearly 900 years from the middle of the 10th Century. The people of the Ladakh region are of Tibetan and Indo-Aryan decent. Ladakh’s culture and history is closely related to that of Tibet. Ladakh includes parts of the Great Himalayan and Karakoram Mountain ranges, the Ladakh range and the upper Indus river valley. The elevation ranges from 9,000 feet at Kargil to 25,170 feet Saser Kangri in the Karakoram range. Zanskar is almost off the map.... 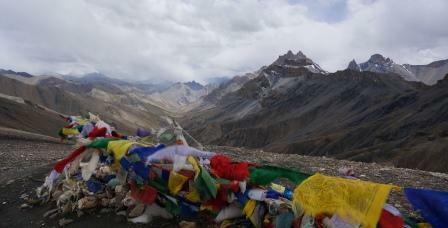 The Zanskar region is extremely remote. There are treks which are entirely wilderness and treks which pass through small remote villages. High altitude wildflowers decorate every route throughout the trekking season. The more remote the trek, the greater the chance you will encounter wild life. As in the Ladakh region there are Blue Sheep, Ibex, Wild Horses, Marmots, Snow Leopards, and many other wild animals and birds to be spotted! The wilderness is amazing and the views are absolutely stunning! 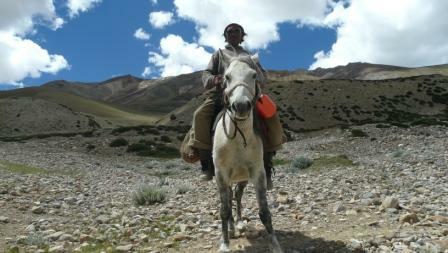 Trekking into or out of Zanskar from or to either Ladakh or the Lahool valley is a great option! Zanskar was at one point part of the kingdom of Guge in Western Tibet. The region includes the Zanskar Mountain range and part of the Great Himalayan Mountain ranges and is made up of an area of about 2,700 square miles. There is only one town in Zanskar, Padam. The elevation in Zanskar is basically between 11,500 and 23,000 feet. The people of Zanskar are from a mixture of Tibetan and Indo-European origins. Almost all practice Tibetan Buddhism. They are nearly self-sufficient living from their livestock and limited farming. To go into Zanskar by road at this point there is only one option – from Kargil over the 14,439 foot (4401m) Penzila Pass. The drive is rough but the scenery is amazing!